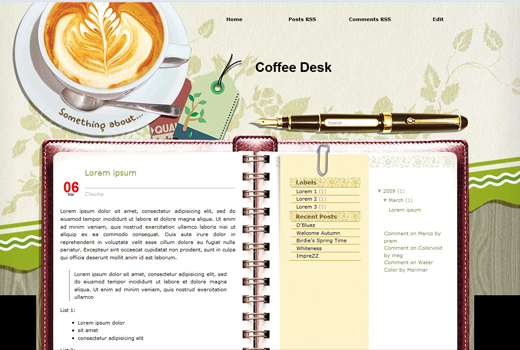 Coffee Desk blogger template for free download on Blogger Templates. Hi, When I went to download “coffee desk” as my background into my blogspot page, the HTML came up in symbols of squares etc. How do I fix this? Hmm you mean the symbol of squares came up on your blogspot? If so, can you show me your blog so I can take a look at what the error is. why when i downloaded this template does a red “undefined” show up where the date should be? how do i fix this? thanks so much! i fixed it! how do i include a chatbox inside? Which chatbox are you using? Chatango or tagboard? I was wondering if there was any way to add the expandable posts html? I tried to do per some other instructions and blogger wouldn’t upload the template with the changes. Anyone able to do this? Hi Elizabeth, not sure what you meant by expandable posts html. But the current version of Blogger is in XML and not HTML hence putting anything in HTML in would not work. I am using this template & love it. I tweaked the code a little to customize my header, fonts & colors on my site. It is working great for me & I get ton’s of compliments on it. My only con for this template is that in the past I used Window’s Live Writer to write my posts on & then transfer to my blog & for some reason, I’m not sure of, it won’t work with this template. Other than that, I have no complaints! If you know just a little html code you can do a lot with this template. OK…My time format (the third field in the edit blog post section of the Edit Layout screen) is formatted corrected; but if you look at my blog, it’s populating all my blogs with the same date field. This is quite irritating…Can you offer suggestions….I’m at my wits end & truly love this layout! It’s taken me quite some time to find one that suited me so perfectly and I just want it to work right. Finding people to follow it and interact with it is difficult as well; but I know you can’t help with that. Hi SweetPea, are you sure you are using that template that is downloaded from here? Cos it seems like the current template you are using is downloaded from another site hence the date problem. The comment poster above you her blog url is danabailey.blogspot.com and there is no problem for her date. That was my next thought that the place where I originally found this layout had something wrong with the code altogether. Thanks for the reply, downloading from here was going to be my next step. Worked like a charm! Many thanks!!! Tnx it is so cool. I love it. hey,i dunno how to fix this…..even i try a lot to removed UNDEFINED sign in red colour upper my post it still not work….can you help me?? ?i try as you said before by using long date format but it still not wokk!!! !also about the function to edit the fonts it is nothing there….also about the element in the template was can not drag anywhere we want….why??? Okay… this is going to sound really dumb. Sorry for my ignorance. I am only new to blogging, and one of the things which convinced me to really give it a go was this template. I’ve uploaded the template, fixed the date thing and it’s all looking good. However, before I uploaded the template, I had a little bar at the top which had links to creating posts etc which is not there now. The only way I can see at the moment to create a new post is to log in to the dashboard part of blogger and do it there. At the moment, all I can do on the page is read the content, search (with the pen which is so cool) and leave comments. Am I missing something? Sorry, me again. In the picture up above, it also has what I think are tags (?) at the very top of the page. “Home” “Posts RSS” etc. How do I get them please? That little menu navigation bar at the top is for the default blogger templates only. Normally blogger made designs by designers does not include that little top bar. For the home, post rss etc. Currently you do not see them right? They are actually menu navigation but is not found on blogger template. Only available on wordpress template. Thanks very much for your reply. It makes things much clearer. Hi There, I love your coffee template. It makes my blog look wonderful. Just one help needed, I want to change the header font – could you please help me with it? Hey, I love this template and I want to use it but I also want to keep my widgets, i’m not tech savvy so I dont know how to tweak stuff, so i’m asking, is it possible to keep my site tracker, and following list? looking forward to your reply. thank u! Depending on what kind of site tracker you have, you can copy and paste the code in a word doc & paste it back in to a widget after you have uploaded your template. Any other buttons you had, just copy & paste into a word doc. Your following list should be fine. The blogrolls & such usually stay there. I think I have the same problem with the other. I’m not an IT savvy thus I had problems to put everything I sued to have before after I download this template coz I forgot to saved the old template first. My 1st prob is about the date. I’ve tried to changed it numerous time according to what you said but nothing happen. How do I changed it then? My 2nd prob is that the normal tab at the top where I can create new post and all is missing. How do I get it back? How do I changed the header? Have you tried the solution fix on the 5th comment on this page? For your 2nd problem, those are blogger navi links and I am afraid they do not appear on custom templates. They appear only on blogger default templates. To write a new post, you have to go to blogger dashboard and write new posts from there. Which header are you referring to? Header image or header font or color? n i think my problem is just the same..
1st: how can i make the top bar appear?? 2nd:is it possible for me to change the font an size and to do it? Which top bar are you referring to? No its not possible to change the font size. Thanks for your prompt reply. I’ve fix the first prob and I’m still trying to get use to this new template. I wanted to change my header of the blog itself. Can I change the fonts? The 1st result of blogtitle will show you the css code which includes the font color, style, type etc. Feel free to change that to your liking. Remember to backup your current file first by copying the whole contents of the codes in ‘Edit HTML’ and saving it into a .xml extension file. Hope that helps! Hi Sara, is this a new blog you setup? I have never come across this problem before. Can you try re-uploading the template again? PLEASE GIVE ME STEP BY STEP TO USE UR TEMPLATE , IN PARTICULATR “COFFE DESK” , please send to my email . . .
thankz before . . . I hope u help me ,. . . .
All you need is to go to ‘Layout’ -> ‘Edit HTML’ and upload the CoffeeDesk.xml file and you are good to go. Hmm, Zoe how did you upload the template? Did you upload by the upload text field function in Blogger or you manually copy the codes of the template into the blog? Hmm ok I see the error now, let me ask my coder to fix it. This template Blogger platform has problem with it, not sure why but somehow the code does not work anymore though it works when previously installed. I am afraid this template will not work anymore. this template work fine on my blog. its cool. however, there’s something i would like to ask. how can i add the Quick Edit link after each post?? is it possible to do so?? Yes its possible but I am afraid I dont know how. Would be best to just go through the dashboard to edit any posts. I cant download the code, the link lead to the same page again. pls refix its. This template is currently unavailable. and my blog can’t save it.. what can i do to solve this problem?? This template is currently not available here. ohh noo..! i loved this blog and itz not available nw..[:P]…! i have a witer freind i want nice templates for him..plz help me out..! The third is the same as the 2nd just right float, etc. So do I assume my sidebar is 163 pixels? Sorry if I sound like an idiot. TIA! hai swank, i can try to fix time format with your way, but thats not work. owh plz.. what should i do ?? why i cant even download? Is there any way I could change the width of the diary? Its too narrow and when a long post is written it ends up being too long. I have refurbished my template quite a bit but this is one thing I could not figure out. When I change the different widths associated with the diary, the center spiral doesn’t align. I really like this template A LOT !! Is there anyway I can download it. I am not able to doso and I just realised that there is a remark indicating that it’s no loner working. i cant download this template..
I’d love to use this template but when I click download, it just refreshes the page. i can’t download this template, everybody can you help me??? This template is currently not working anymore. It is written in the post above. Sorry about it. Somehow the template broke in the new browser versions. I will try to see if it can be fixed but no guarantee. Hi, when Iam trying to download this template, its showing the same page once again. Is it no more available for download? I’ve downloaded one theme earlier, but couldn’t customize it to well. This one seems perfect to my taste. Can u help me get the xml file? oh ! its a pity that such a wonderful template is lost. Plz try to fix this and upload again. Its one of the best creations in blog templates I’ve ever seen. I wish I could download it …. Ok I will try my best to see if this can be fixed. hye, i wanna ask, i want to edit the font colour of my ‘about me’ info..
i can’t download it (( clicking the link just refreshes the page. To the admin, will you let us know when it’s fixed, or post an updated code? I can’t download it to … what can I do to download it? i love this template..where i can download this template??? can i get this on my blog??? how can i get this on my blog??? What do you mean by returning the money? We have never charged any templates on this site. All templates are listed and downloadable here for free. This template is unfortunately no longer available due to some coding errors on it. You may browse other templates and click on the Download button to download for free. I tried to download it, but it doesn’t download. Will you be re-posting the download link for this template? hi,,can you tell me how to download this template?? ?i don’t know how to do this..
hai..i don’t know how to get this to be my background..help me please. I am sorry but of all templates here, this is the only one that cannot be downloaded due to some code errors. Please download another template thanks. it performs perfect… just founded the IIS server . I have just downloaded this template and so far so good. I would suggest if possible to add a blurb in the text area of the download that states how to change the time format to the long version so as not to get the big red bold “undefined” message. Other than that so far so good. I am going to try posting a trial post since I am updating for the year, but will definitely show some monetary love if there are no other issues. Thanks for the great design and sophistication in this template. I have been using this since January. After updating the page elements area for the time and date I have had no issues to speak of until I tried to integrate the social media elements into the page. I highly recommend this template, but there are a couple bugs that should be looked at. I definitely contributed because I think it should still be in circulation. Thanks again for a great product! i click the Download button and notting happens. I cannot download this template. Below the screenshot it says “**This template is no longer working**”. What does that mean? Um, when I click “Download,” nothing happens! it just reloads the page. Help? We treasured your post, it really added in a terrific viewpoint on trading. Bless you. i cant download! when i click download, nothing happens, just reload the page. please help me, i love this template so much! Hi !!! the template is deliciousssss . it s exactly what i do while blogging, drinking coffee and check up my agenda before i leave from my house <3 but i need a huge favour !!! — do u know how could i possibly put a mini bio and a photo of me ? so they can possibly click on the photo for example and go to my main blogger profile page… thanks !!! when I clicked download, It’s just refresh this page and nothing .zip appears in my google chrome?